Inspired by Frances Schultz’s popular House Beautiful magazine series on the makeover of her East Hampton house, Bee Cottage, what began as a decorating book evolved into a memoir combining the best elements of both: beautiful photos and a compelling personal story. Schultz taps into what she learned during her renovations of Bee Cottagedetermining how each area in the house and garden would be used and furnishedto unravel the question of how a mature, intelligent, successful woman could have made such a mess of her personal life. As she figures out each room over a period of years, Frances finds a new path in life, also a continual process. She comes to learn that, like decorating a home, our lives must adapt to who we are and what we need at different points along the way. The Bee Cottage Story is part memoir, part home decorating guide. Frances discusses the kinds of useful, commonsense design issues professionals take for granted and the rest of us just may not think of, prompting the reader to examine and discover her own truth” in decoratingand in her life. Frances Schultz is a contributing editor for House Beautiful magazine and regularly writes for Veranda and travel website Indagare. She has also written for the Wall Street Journal and Town & Country, and has been a guest on the Today Show. She is author and co-author of several books on decoration, design, and entertaining, including Atlanta at Home, Atlanta at Table<?i>, Ryan Gainey’s Well Set Table, Christopher Lowell’s The Hassle Free Host, Michelle Rago’s Signature Weddings, A House in the South, and the popular The Bee Cottage Story. "Lighthearted, self-indulgent, frivolous, and likablea good beach read, especially in the Hamptons." "The book is part memoir and part decor manual making it all the more worthy of setting aside a morning or afternoon to devour." "Goes behind the scenes to explore the nitty gritty of the decorating process in an honest, candid and funny way." "Like other great memoiristsM.F.K. Fisher, Frances Mayes, Elizabeth Gilbert, and Karen Blixen come to mindFrances has written a book that is more than just another memoir." "Finally... a decorating book for people who aren't afraid of 'pretty.' Frances can make anything pretty, from a breakfast tray to a guest room to a garden. Bee Cottage is pure joy. Color, comfort, and Frances. It's the happiest house I know." 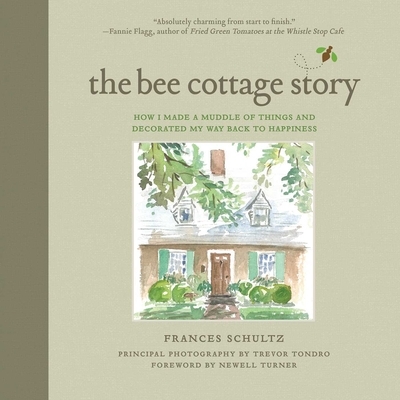 "The Bee Cottage Story by Frances Schultz is a true delight. Every woman in America will love this witty, wise, and wonderful book. Absolutely charming from start to finish." if I hadn’t already done that many years ago!" "The Bee Cottage Story is a refreshing memoir that defines the art of living well, uniquely illustrates Frances Schultz’s passion for aesthetics, but at the same times she gives us a window into her character. She reveals that she is more than just a woman of style: She is a woman of substance." "I have said for years that in my next life, I want to be funny. Today, after getting to know Frances Schultz, reading her thoughtful and laugh-out-loud blog, and reveling in her marvelous book The Bee Cottage Story, I can amend my comment and say, 'In my next life, I want to be funnyjust like Frances Schultz.' Her humor is the down-home sort that I love, and resonates so because it is infused with grace, common sense, and humanity." "The Bee Cottage Story is an affecting and eminently readable memoir of love and loss, forgiveness and discovery, the healing power of decorating, and the self-knowledge gained by creating a home. I loved reliving the author’s journeyroom by room, experience by experience. The design tips are swell; the life lessons even better. Schultz’s voice is at once insightful, funny, self-deprecating, wise. Reading this book is like having a revelatory chat with your smartest, dearest friendin very cozy surroundings." "The Bee Cottage Story is laced with laugh-out-loud dry humor as Frances Schultz peels back the onion of her mercurial journey through cancer diagnosis, recovery, and lost and regained love; whilst dispensing well-honed decorating advice. Her beloved Bee Cottage is the laboratory for re-shaping her life, both inside and out." "Certainly one of the best books I have read in a long time." James Andrew, "What is James Wearing?"